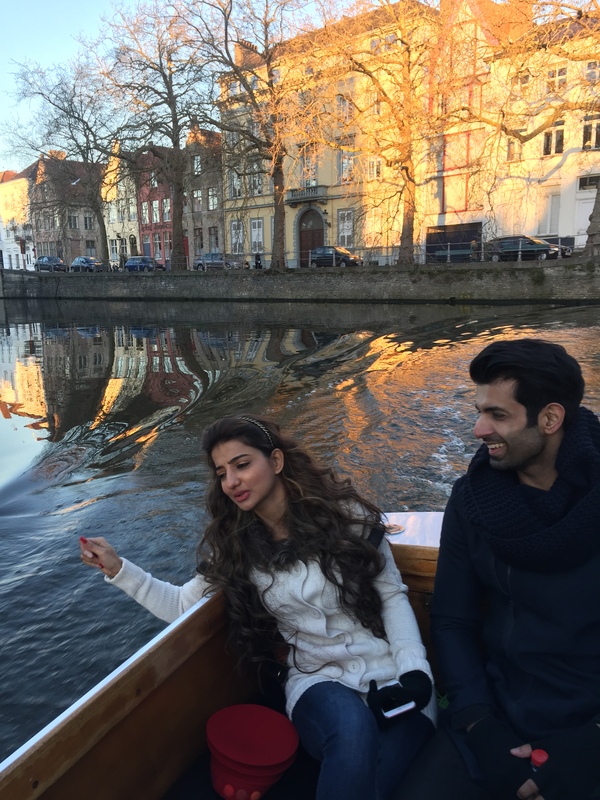 TV actors Namik Paul and Lovey Sasan went total filmi in quintessential Yash Chopra ‘s Bollywood style at the beautiful locations of Europe’ s Belgium. The lovely state of Flanders was the destination for Namik and Lovey to go full romantic . After the show ‘Ek Duje Ke Vaaste’ ..actor Namik Paul is doing a TV series with ‘Saath Nibhana Saathiya”s Paridhi that is Lovey Sasan for Aajtak.Titled ‘Befikre Belgium Ke’ the TV the destination TV series features Namik and Lovey pairing for the first time as they never worked together before. The TV series was shot in the state of Flanders in Belgium-Europe in the cities of Brussels, Bruges, Ghent and Antwerp. Lovey and Namik bonded very well during the shoot over their love of cinema .. It was freezing cold in Bruges but lovey wore a red chiffon saree like Yash Chopra heroine and danced on the streets and canals of Bruges. In the minus degree Lovey dared to wear the saree when everyone was freezing with cold. While Namik was dressed in black like Shahrukh Khan of most Yash Chopra films. It was like the scene of recently released ‘Aey Dil Hai Mushkil’ Moment when Anushka Sharma and Ranbir Kapoor also recreate this Bollywood saree moment in the freezing cold of Europe. Lovey and Namik shot in picturesque in Bruges where PK was the first Indian film to be shot , both Lovey and Namik recreated the Chaar Kadam song that was pictured on Anushka sharma and Sushant Singh Rajput. The same locations were film ‘PK’ was shot in Bruges by director Raj Kumar Hirani were the places Namik and Lovey also shot.While shooting in Ghent ..the local crowd were shouting PK as they though the same team is shooting..
Lovey and Namik also relished the vegetarian food of Ghent which is regarded as the vegetarian capital of Europe. The capital city of Belgium that is Brussels known for its Gothic architecture was Lovey and Namik favorite places to visit. Namik and Lovey also visited the famous comics museum where worlds best cartoons are preserved …Also both shopped for the famous Belgium chocolates from Brussels. In the city of Antwerp.. Namik and Lovey also shopped for diamonds and enjoyed the variety of cuisine of this bustling city of Belgium Flanders. The TV series is been directed and Produced by Amit Tyagi and airing this whole December every Wednesday on ‘Saas Bahu Aur Betiyaan’ on Aajtak. Click through the ‘Next’ tabs to browse through the pictures of Namik and Lovey from Belgium. Click the ‘Next’ button to browse further!